Hamstring strengthening exercises work to strengthen the backs of your thighs, help to transmit power between the knees and hips and help support your lower back. Weakness in the hamstrings can lead to all sorts of problems and affect daily activities. There are three hamstring muscles on the back of the thigh, semimembranosus, semitendinosus and biceps femoris. Here, you'll find some simple yet really effective hamstring strengthening exercises that you can do at home. They get progressively harder as you go through! Before starting hamstring strengthening exercises it helps to know a little bit about what the hamstring muscles do. The main function of the hamstrings is to bend the knees, important in activities such as running, jumping and climbing stairs. They also help to control actions such as kicking, working as the brakes when you swing your leg, and help rotate the lower leg to control foot position as you walk. The other function of the hamstrings is to work with the glutes to help extend the hips in activities such as standing up from sitting, squatting and jumping. So let's get started with hamstring strengthening exercises. I recommend you start with one set of 10 reps of each exercise unless otherwise stated. As you get stronger, add in another set of 10 reps, and then another until you are up to 3 sets of 10 reps. Once you can do that, move on to the more challenging hamstring strengthening exercises! These hamstring strengthening exercises are the perfect place to start if you are just starting out with strengthening work or are recovering from an injury. Theraband is a specially designed elastic band that provides graded resistance to exercise. 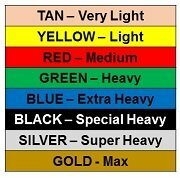 It is available in a range of resistance levels (each a different colour) so it is very easy to gradually progress the hamstring strengthening exercises, so the same exercise can be done just with different resistance levels as you get progressively stronger. Make sure you can happily do the beginners hamstring strengthening exercises before you try these, particularly if you are recovering from an injury, and start with a low resistance band, such as tan or yellow. Theraband is a really effective, yet simple and cheap tool to make hamstring strengthening exercises more challenging and fun. Purpose: These bridging exercises are all great, progressive hamstring strengthening exercises that also work the glutes. The glutes and hamstrings work together with activities such as running and climbing stairs so it is really good to work them both together. These hamstring strengthening exercises get progressively more challenging so start at the beginning and work through as able. 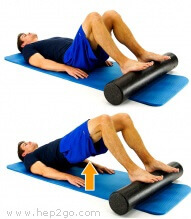 Having a foam or air roller underneath your feet as you do these hamstring strengthening exercises makes your hamstrings and core work much, much harder – beware of cramp – it’s a good idea to make sure you have stretched the muscles out before doing hamstring strengthening exercises on a roller. You will probably need to start with a lower number of reps with roller hamstring strengthening exercises than with the simple bridging exercises. Another great progressive set of hamstring strengthening exercises. You need a large inflated gym ball for these exercises. Stage one is suitable for beginners. Action: Slowly curl the ball towards your body, bending your knees and then slowly roll the ball away. It is always a good idea to do stretches alongside hamstring strengthening exercises. Muscle work most efficiently when they have the right combination of strength and length. You can find a whole range of stretching exercises in the hamstring stretches section. 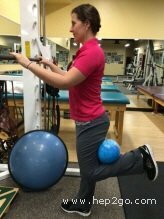 It is also important to work the other muscle groups around the knee and hip along with hamstring strengthening exercises to ensure a good balance throughout the leg. Visit the knee strengthening exercises section for loads more exercises that can help.